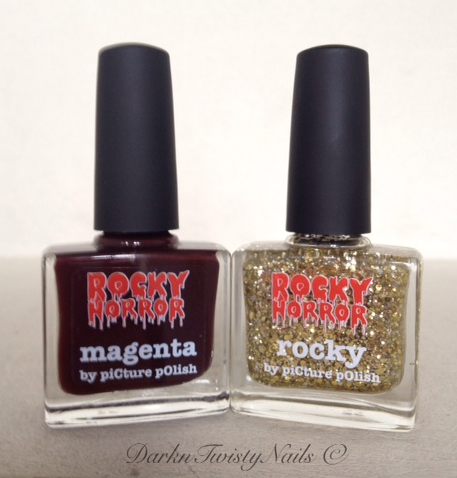 When I was younger, I loved The Rocky Horror Picture Show and I still watch it at least once a year. So when I heard Picture Polish was coming out with an entire collection based on this awesome, over the top movie, I knew I had to have them all! Especially since they are all darkntwisty shades. Red, blue, deep dark browntoned red... be still my heart! I ordered them as soon as they were available and I absolutely love all of them! Unfortunately there was a little delivery error with Time Warp, so I'm still waiting on that one. 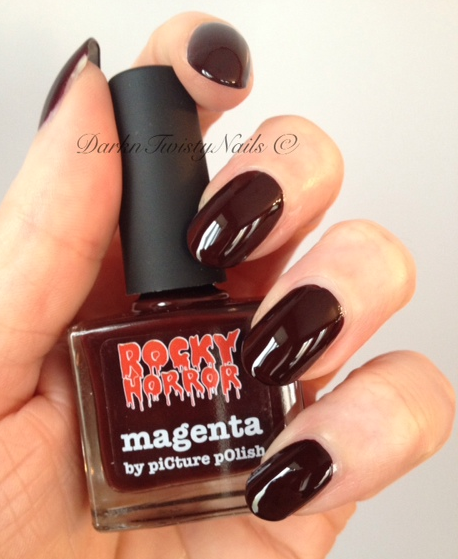 Picture Polish Magenta is a deep, dark, vampy maroon cream. This looks brown in some lights and more red in others, but it never looks black. The formula was perfect, like all picture polishes I've tried so far. 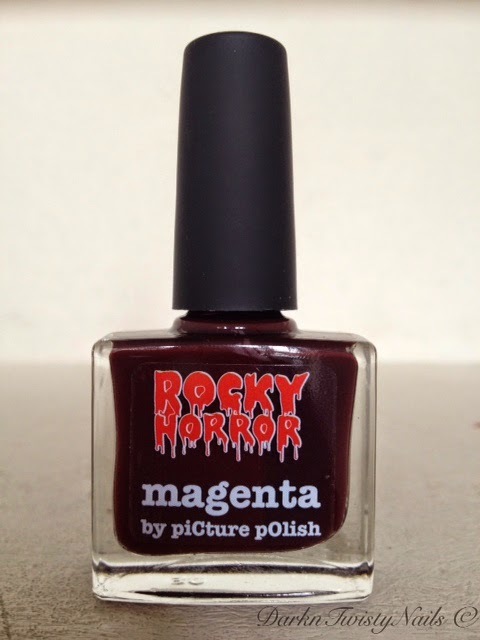 It glides on the nail with ease, is opaque in 2 thin coats and dries really fast and extremely glossy. 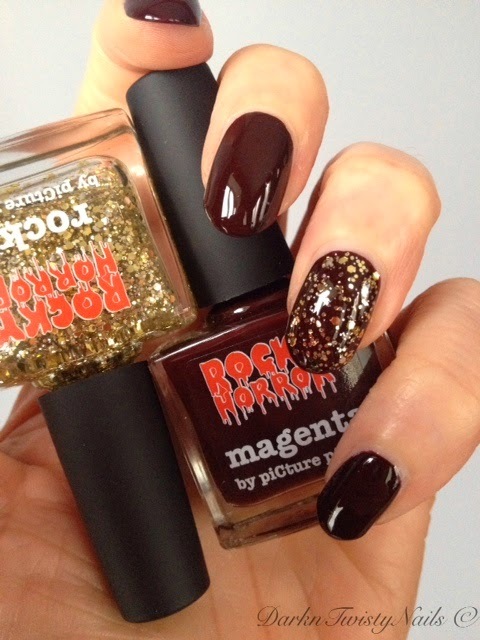 I decided to spice it up just a bit with Picture Polish Rocky as an accent. This is a gold glitter topper in a clear base. I love these two combined! I almost didn't order Rocky, but I'm so glad I decided to get it after all. It's unique to my collection and the formula is really nice. No fishing or dabbing required. This is just one easy coat. I can't wait to try the others and you'll definitely see them here soon! Have you ever seen the movie and if so, what is your favorite part? Oh wow, dit is iets wat ik niet had verwacht! Vond deze twee kleurtjese de minste uit de collectie, maar wat een waanzinnige combinatie! Staat je geweldig! Ik vind ze ook echt helemaal fantastisch! Zitten ook nog eens al 3 dagen goed, dus ik ben fan! 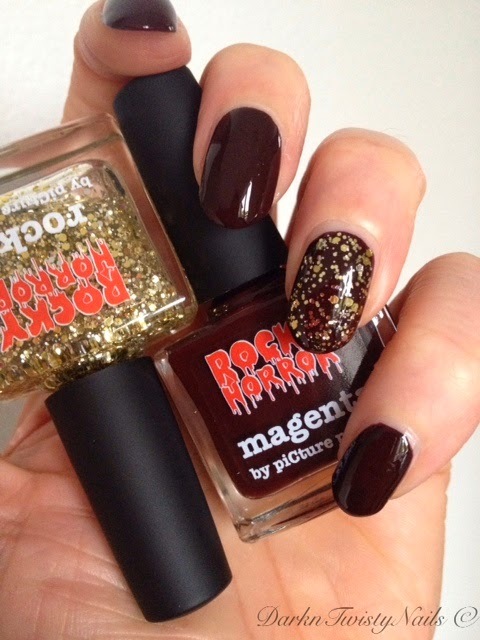 Great polishes...I love the bottles!